There are many reasons to wrap in a blanket. The cold is only one of them. Sometimes a girl just needs comfort. 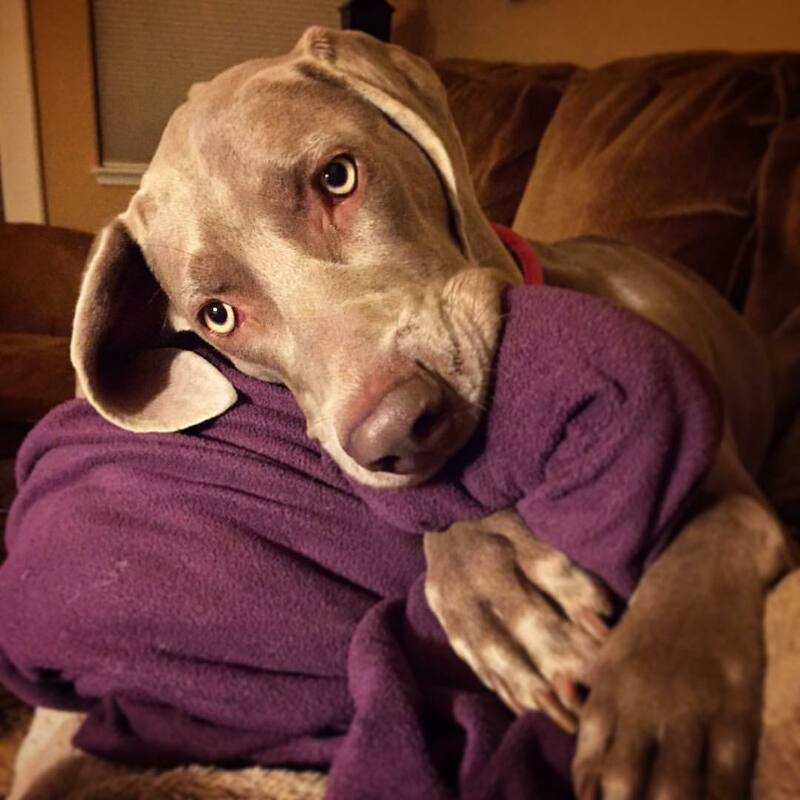 A book and a blanket are a personal favorite–Weims like traditional books too. The problem is their plan usual ends badly for the book. At 4:30 pm every day–like clockwork, Maizie very politely puts her paw on one of us–reminding us what time it is….her dinner time! The time change since Sunday has thrown her through a loop! At 3:30 now, here comes her polite paw–telling us that her tummy says it is 4:30! When we tell her, “It’s not time,” she doesn’t understand. We have tried to ride out that hour with a “cookie” until she settles in. I hope this happens soon! I can’t stand the sad look on her face! Breeder’s Comment — we have a similar problem. For years, I have told people these guys can tell time. It is uncanny how they know it is time for bed. If we happen to be watching a football game or some program that runs late, they are not amused. They keep giving us a prompt because surely we don’t know time is running over. It is like the pastor who preaches over the usual cutoff time. The congregation people are rocking in their seats. Their thoughts are wandering, and they secretly wonder if they can get a seat at their favorite lunch table. Humans are not the only clock watchers. The time change is not amusing to the Weimaraner. At our home, this more about them rocking on their paws and ready to bound toward the door to potty and check in for bed. Oh, how I wish our children would have been so excited to get tucked in bed for the night. This scheduling thing (with the Weimaraner) is not exclusive to the dinner time or bed time. Coming home from work late can be a cause for great distress, and your delay may lead to the shredding of something. This time telling nature is not solely a homefront issue either. They also know the time in the car. We know of more than one family that has ended up being too long at an appointment, and the waiting Weimaraner has chewed the interior of the vehicle due to their anxiety. (They fear you have abandoned them and forgotten they are awaiting your arrival.) In one situation, the Weimar chewed the wiring harness to the tune of a $20,000 repair bill. Time is something to consider, and the routine loving Weimaraner doesn’t want you ever to forget they are clock watching too! Thank You! We are glad Maggie has found a great fit into your Two Weim Household. She looks happy and at the same time busy. Thank you for calling her priceless. We hope she continues to do well and proves to be an excellent field dog too! Best to you and have a wonderful pumpkin season. Frisbee, please, before friends arrive. We write to you on this beautiful Fall Day from Belgium! The sun is out! Jorja is Jorja as in the true Weim fashion. As always I thank Auntie Arleen (Arliss ‘ mom) Jorja is the best! However, she made this all possible, and by that I am not leaving Cliff and Shela out of the equation. Without my sister, I would not have made the connection, and getting Jorja to Belgium would have been much more difficult. Pretty pictures don’t always tell the truth. In fact, Jorja was on her best behavior along until the end of our visit. We had dinner guests on the way, and I didn’t throw frisbee with her as long as was needed. As guests were leaving Jorja ate the last eight pork chops off the table! Her first time and “hopefully” the last time table surfing. Then the next morning she rolled in stinky stuff. Pay back. We are now backing up and reviewing old rules for the household. We had slacked off on making her follow the rules prior to the pork chop incident. Jorja has behaved well of late. We got slack in our requirements–lesson learned. Needless to say, we still love her so much!